A Management and Adaptation Planning Guide for Natural Resource Managers. 2006. Pacific Islands Managed and Protected Area Community (PIMPAC) document. This document was developed for the Pacific Islands Managed and Protected Area Community (PIMPAC) to provide a step by step guide for Marine Managed Area (MMA) management planning. However, given more recent interest in incorporating climate change adaptation concepts into existing planning processes, this guidance has been updated to include guidance on understanding climate change impacts and including adaptation in the planning process. Marshall, P. and Schuttenberg, H. 2006. A Reef Managers Guide to Coral Bleaching. Great Barrier Reef Marine Park Authority, Townsville, Australia. A hopeful vision of the future is a world in which both people and nature thrive, but there is little evidence to support the feasibility of such a vision. We used a global, spatially explicit, systems modeling approach to explore the possibility of meeting the demands of increased populations and economic growth in 2050 while simultaneously advancing multiple conservation goals. Carbon Emissions from Forest Loss in Protected Areas. Janishevski, L. and Gidda, S.B. 2010. Carbon Emissions from Forest Loss in Protected Areas. Secretariat of the Convention on Biological Diversity (SCBD) and UNEP; Issue Paper No. 6. This study combines the best available data on carbon stocks and deforestation with protected area data to estimate the area of forest loss within the protected area network of the humid tropical forest biome during 2000-2005. Regions where protected areas are simultaneously rich in carbon and under pressure from land cover change are identified. The authors report high carbon density in Papua New Guinea and recommend enhancing management of forested protected areas in this area (along with Australasia). Cleaner Pacific 2025 is a comprehensive long-term strategy for integrated and sustainable waste management and pollution prevention and control in the Pacific islands region over the next decade (2016–2025). Cleaner Pacific 2025 provides a strategic management framework to address waste, chemicals and pollutants (WCP) that will reduce the associated threats to sustainable development of the region (Table 1). Perry, J and C. Falzon. 2014. Climate Change Adaptation for Natural World Heritage Sites: a Practical Guide. World Heritage Papers 37. Grimsditch, G.D., and Salm, R. V. 2006. Coral Reef Resilience and Resistance to Bleaching. IUCN, Gland, Switzerland. This IUCN publication has information on the factors affecting tolerance of corals to increased temperatures and mechanisms by which corals can avoid bleaching during periods of warmer temperatures (e.g. ocean currents and upwellings). The second section of this technical document provides information on ecological and spatial factors affecting resilience of corals. The third section discusses management for coral bleaching (e.g. coral transplanting, MPAs etc.) but does not go into detail. There is a useful table of management handbooks on page 27 for those wanting more details on management. Our rapidly warming climate is threatening coral reefs as thermal anomalies trigger mass coral bleaching events. Deep (or “mesophotic”) coral reefs are hypothesised to act as major ecological refuges from mass bleaching, but empirical assessments are limited. We evaluated the potential of mesophotic reefs within the Great Barrier Reef (GBR) and adjacent Coral Sea to act as thermal refuges by characterising long-term temperature conditions and assessing impacts during the 2016 mass bleaching event. We found that summer upwelling initially provided thermal relief at upper mesophotic depths (40 m), but then subsided resulting in anomalously warm temperatures even at depth. This Pacific Sustainable Development Report 2018 (PSDR) is the first quadrennial Pacific progress report on sustainable development. The report outlines high level trends on progress to date, as well as baseline information. The regional report complements national monitoring and reporting and since 2015, three Pacific Islands Forum member countries (Samoa, Kiribati and Australia), have completed their Voluntary National Review processes, and reported to the High Level Political Forum on Sustainable Development. (HLPF). Fiji, Nauru, New Zealand, Palau, Tonga and Vanuatu are reporting to the 2019 HLPF on sustainable development. The PSDR 2018 highlights the need for increasing the pace of progress towards the achievement of the 2030 Agenda. The five IKM4CC Guidelines provide detailed advice on a range of information management topics and practices. The guidelines are relevant to information managers, information officers and any other people involved in collecting, storing, describing or sharing climate change-related information. Twenty years down the road from the Barbados Programme of Action (1994) and ten years after the Mauritius Strategy (2004), Small Island Developing States (SIDS) are in Apia, Samoa to take stock and define future priorities at the Third International Conference on SIDS, from 1 to 4 September. A picture based education resource for students, teachers and facilitators. It introduces Pasifika as an imaginary island that is nowhere but everywhere. Pacific learners and explorers can find local buildings, plants, animals, people and geographical features they can relate to. The guides have been produced for Fiji, Kiribati, Samoa, Tonga, Vanuatu and Tuvalu in close partnership with these countries. The information is also relevant to all Pacific Island countries and territories. MIT Climate CoLab (www.climatecolab.org) is an online crowdsourcing platform of over 58,000 members from around the world, sourcing innovative proposals on addressing climate change. Topic areas include land use, agriculture, and forestry, reducing emissions from the buildings and industrial sectors, creating sustainable ground and air transportation systems, smart zero-carbon cities, and many more. This report provides information for managers regarding the potential impacts of climate change to mangrove forests (e.g. impacts of changes in temperature, CO2, rainfall, storms frequency, sea level rise). Ten strategies are provided for managers to apply in order to promote resilience in mangrove locations. The guidelines inform managers how to assess mangrove vulnerability to sea level rise. This information is of the utmost importance to managers in all Pacific Islands. The authors provide both low-tech and high-tech solutions. In this article, I explore the knowledge and values that allowed the people of Oceania to develop sustainable use of their marine resources, followed by the demise of these systems after western colonization and the breakdown of traditional societies. The current renaissance of customary stewardship has resulted in not only more effective management, but also a cultural reawakening in many of these island nations. The integration of customary and contemporary management regimes holds great promise for reducing reliance on foreign goods and services, while also improving social cohesion. Climate change is the single greatest threat to the livelihoods, security and wellbeing of the peoples of the Pacific. This was reaffirmed last year when Pacific Island Forum Leaders identified climate change as one of the top five regional priorities under the Framework for Pacific Regionalism, and at the same time issued the Declaration on Climate Change Action for the UNFCCC COP21 in Paris. The declaration built upon other high level declarations issued by the region prior to COP21. The Pacific Adaptation to Climate Change (PACC) Programme is the first major climate change adaptation initiative in the Pacific region. Since it began in 2009 the Programme has been laying the groundwork for more resilient Pacific communities that are better able to cope with climate variability today and climate change tomorrow. The Programme approaches this from two directions: it is working to enhance adaptive capacity on the ground, and it is driving the mainstreaming of climate risks into national development planning and activities. The Pacific Islands Climate Change Cooperative (PICCC), headquartered in Honolulu, but working across the Pacific, integrates local climate models with models of climate-change responses by species, habitats, and ecosystems. The PICCC was established in 2010 to assist those who manage native species, island ecosystems, and key cultural resources in adapting their management to climate change for the continuing benefit of the people of the Pacific Islands. This four page issue paper discusses the importance of protected areas, which while under threat from climate change, provide a natural and economical means of mitigating and adapting to its effects. It describes the need to strengthen protected areas (e.g. in respect of management and governance), and to expand and ensure their connectivity in order to improve the global response to climate change. Edwards, A.J. (ed.) 2010. Reef Rehabilitation Manual. 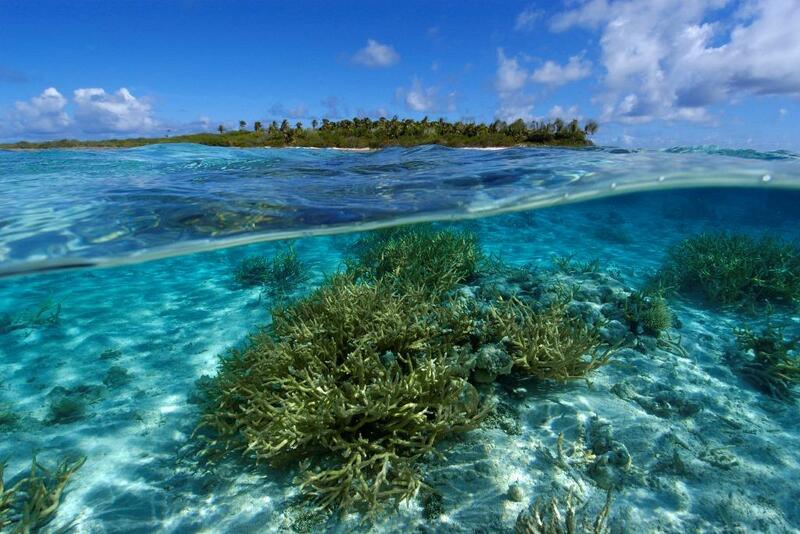 Coral Reef Targeted Research & Capacity Building for Management Program: St Lucia, Australia. This manual captures the learnings of worldwide research into reef rehabilitation and seeks to reduce the proportion of reef rehabilitation projects that fail. It provides detailed hands-on advice, based on lessons-learnt from previous experience, on how to carry out coral reef rehabilitation in a responsible and cost-effective manner. Methods described include: constructing and managing nurseries for asexual rearing of corals; rearing coral larvae for reef rehabilitation and methods of coral transplantation. Campbell, A., Dickson, B., Gibbs, H., Hansen, M., Kapos, V., Lysenko, I., Miles, L. Scharlemann, J. 2009. The Role of Protected Areas in Storing Carbon and Reducing Emissions. IOP Conf. Series: Earth and Environmental Science 6. In this abstract for a presentation, the authors combine the best available data sources for carbon in vegetation, soil, protected areas and deforestation, to estimate the amount of carbon stored within protected areas.. They go on to provide an estimate of emissions from deforestation within protected areas of the humid tropical biome in the years 2000-2005.